While I love Woody and Buzz and McQueen and Mater and Sulley and Mike, they all take a back seat to the two standout heroines of Inside Out. A film set in the mind of an eleven year old girl, Pixar’s latest is easily its most difficult, its most cerebral (literally), and its most deeply felt. For a film dealing with emotions, Inside Out certainly doesn’t shy away from helping its audience feel them. In simple terms, Inside Out is the story of one girl’s growing pains. 11 year old Riley is uprooted from all that is important to her in her life in small-town Minnesota: friends, her hockey team, the lake she skates on each year. Moved across country to the weird world that is California–San Francisco, in fact–she discovers that being happy isn’t as easy she–or her parents–want it to be. The house is old and has a dead mouse in the corner, the first day of school goes horribly wrong, and her tryout for a new hockey team just goes worse. Pre-teen angst at its best and worst, and suddenly Riley is sullen and angry, her parents don’t know what to do, and the “happy girl” is nowhere to be found. The story would be almost mundane if not for the fact that we watch all of this unfold through the eyes of Riley’s emotions–feelings that run the control booth in her mind. Joy, Fear, Anger, Disgust, and Sadness all vie for their space at the console, but it is Joy who leads the way, and in truth, is the story’s main protagonist. Always looking for a way to make things right, make it ok, and turn every sad moment into a happy one for Riley, she goes at length to push the melancholy Sadness as far away from the controls as she can, setting in motion the events that cause Riley to go from a pretty even-keeled kid to the girl who yells at her dad and steals from her mom. In the opening moments, the film helps us understand that Riley’s personality is represented through a series of themed islands, like Honesty, Family, Friendship, and my favorite, Goofball. Core memories power these islands and help shape Riley into who she is. As various memories form for Riley, they arrive in the form of glowing orbs, colored by a particular shade of emotion. As the days in San Francisco wear on, there are less and less of the yellow Joy orbs and more and more of the other ones, especially Sadness. When the day at school goes horribly wrong, Joy and Sadness are sucked out of the control room and into the recesses of Riley’s mind, leaving the other three to do their best to run Riley’s emotions, with disastrous results. From here on, Inside Out crosscuts between Riley’s inner and outer worlds as Joy and Sadness go on a road trip through Riley’s cerebral wonderland. Here they discover the train of thought that runs crazily while Riley is awake, Imagination Land (where they discover an imaginary boyfriend who would “die for Riley” and is from Canada taking the place of the Stuffed Animal Hall of Fame and other childhood favorites), her subconscious (where all the scary memories live, and yes, I am clearly not the only one in the world terrified of clowns), her ability to process and deal with abstract thought, and, in a hilarious scene, the studio that creates her nightly dreams. The production credits are all top notch. The voice cast is excellent, the art direction is impeccable. And the music by studio favorite Michael Giacchino (he created the stellar scores for Up and Ratatouille) is stunning in its simplicity, but constantly growing and changing, just like Riley. It’s easily his best work since Up, and the main theme, “Bundle of Joy,” will be as ubiquitous to baby videos as his “Married Life” (from Up) was to weddings. The film is dazzling when it needs to be, but it’s not jaw-dropping like it was when we first saw Toy Story or marveled at Finding Nemo. The characters are simply drawn, although I loved the way the emotions weren’t completely solid, something I can’t truly describe, but you’ll understand when you see the film. The film looks great in that way we expect from the studio, but it’s not what it looks like that makes it great. It’s the story. 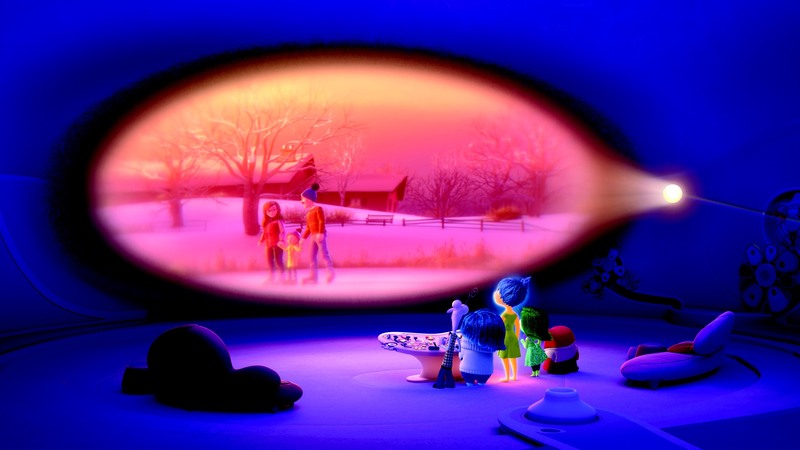 What Pixar does with Inside Out is every bit as incredible as what it did with Wall*E or Up, and even more so. Inside Out is the brainchild of Pete Docter, who created Up, one of the most emotionally resonant Pixar films, which explained more about marriage in 10 minutes than most films do in hours. Up was ostensibly a grand adventure started by Carl Frederickson to fulfill a promise to his wife, Ellie–until the audience realized it’s actually about the incredibly difficult task of letting go. And that’s one of Inside Out‘s big ideas, too, letting go of childhood and growing up–one that Docter presents in a beautiful, powerful way that left me wiping tears away several times throughout. One of the greatest gifts to Inside Out is Richard Kind’s performance as Bing Bong, a forgotten imaginary friend who has spent his days scavenging memories on the dusty shelves of Riley’s memory bank. A tragicomic figure, he’s part elephant, part cat, part dolphin, and all sorts of feels. As he struggles to deal with Riley’s forgetting of him, we get the first glimpse of what the film is really all about. It’s the power of these emotions, these memories, that pushes Inside Out ahead of other worthy Pixar films like Toy Story or Up. It’s emotionally poignant without ever becoming cloying or sappy. The most emotional moments–there are plenty, and I confess that I ugly cried at one point–are followed by a great comic moment, a recurring joke (“TripleDent Gum will make you smile!”), or some other truly hilarious scene. The film’s pacing is spot on, never staying too long in the more melancholy moments, but never zipping past them, either. We feel sad, several times throughout the film, but we come away with the realization that it’s ok. We need Joy, but we need Sadness, too. As a parent, it’s helped me think differently when my children are going through emotions, causing me to think twice about what may be at their control board, realizing that forcing them to “show me happy” is doing them a disservice and keeping them growing the way they need to. It’s the reason this film has resonated so deeply with me, far beyond the wonder of talking toys, monsters, or a world of cars. This is a film that, in spite of it’s marketing as a big family fun summertime adventure, is a deeply personal reflection on what it means to grow up, to experience memory, and help parents remember exactly what it felt like to be a kid growing up. That’s a lot for an animated film to pull off. Inside Out does it, beautifully. Which is why it may very well be Pixar’s greatest achievement. Thanks for your excellent review. I am very excited to see Inside Out. I plan on seeing it with my granddaughter, I believe it will help her process her grief of losing her papa. I am sure that it will be cathartic for me as well.